The Ryerson men’s basketball team is headed for the Ontario University Athletics (OUA) final after defeating the Windsor Lancers 96-77 Friday evening. The team will be playing for the OUA gold medal against the Carleton Ravens at 8 p.m. on Saturday evening at the MAC. With the win, the Rams have also cemented a spot in the Canadian Interuniversity Sport (CIS) championships. In Friday’s semifinal action, the Rams had trouble finishing plays, but they led the Lancers 21-17 after the first quarter. Fourth-year guard Adika Peter-McNeilly led the Rams, as he knocked down one three-point shot and scored a total of seven points in the quarter. Rams centre Kadeem Green was a defensive anchor in the first quarter, contesting every Lancers shot that was taken in the post. Green also pulled in six rebounds and two blocked shots. Midway through the second quarter, Green knocked the roof off the MAC with a huge blocked shot. But, with three minutes left in the first half, the Lancers led the game 37-36. After a Rams timeout, the Rams came back to lead the game 49-42 at the half. The leading scorer for the Rams at the half was Peter-McNeilly, with 11 points. Green registered eight points, eight rebounds, one assist and four blocked shots in the first half of the game. The third quarter started with the home crowd chanting in support of their Rams, and the team responded well. The Rams went on a quick run, increasing their lead from seven to 12. The third quarter was all Rams. The athleticism and talent of the Rams squad just proved to be too much for the Lancers. JV Mukama, a 6’8’’ third-year forward for the Rams, knocked down two three-pointers in the third quarter, notching his total to four on the game. Along with Mukama, Rams guard and star player Aaron Best took control of the game in third quarter. Going into the fourth quarter Best led the Rams in points with 17, and more importantly, the Rams led the game 74-55. The fourth quarter was much of the same, with the Rams leading from the opening whistle. 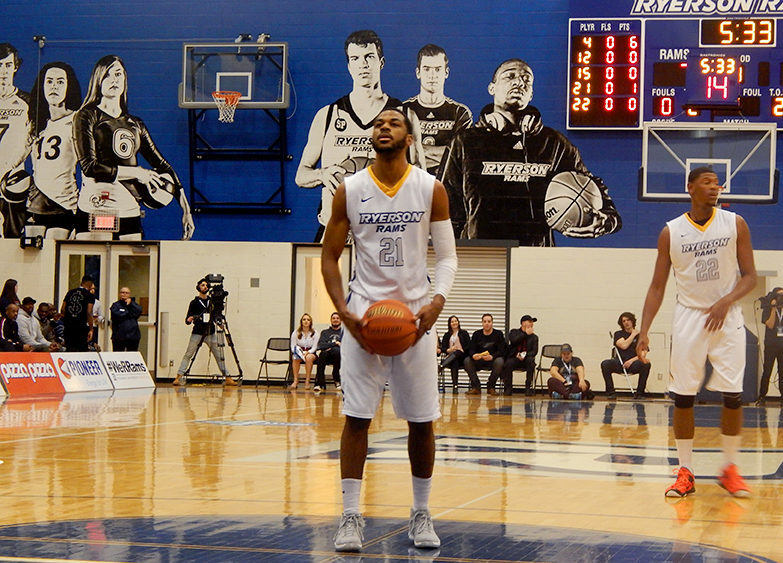 The Lancers quite simply could not keep up with the Rams, and Ryerson did not let up. The final score of the game was 96-77 in favour of the Rams. While players like Peter-McNeilly and Best step up on a nightly basis, it was Mukama who added some very important secondary scoring. Mukama led the team in points with 23 while shooting five-for-five from the three-point line, which is a great rate for any player.